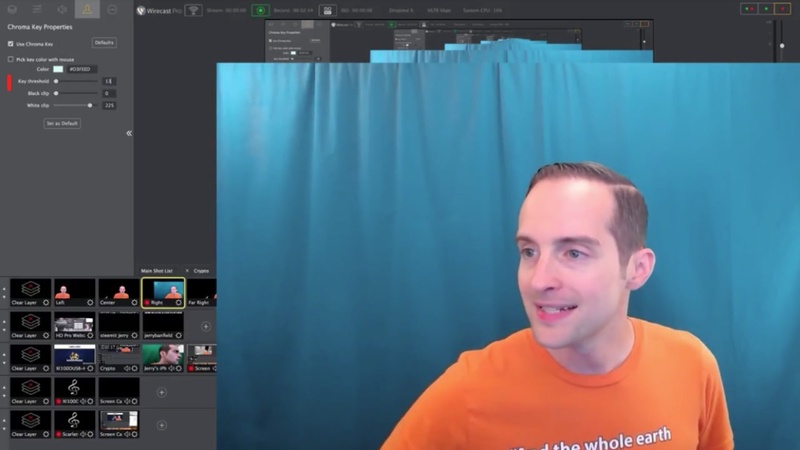 Setup a Chroma Key Perfectly in Wirecast + No More Rendering! 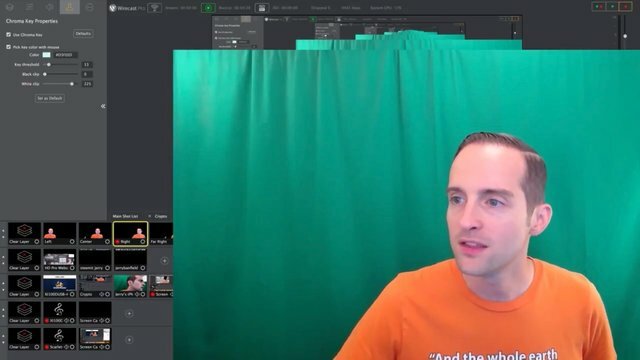 How do we get the green screen on Wirecast or any chroma key to look perfect without overcorrection leading to our face being distorted or not removing enough of the green and leaving artifacts in the background? 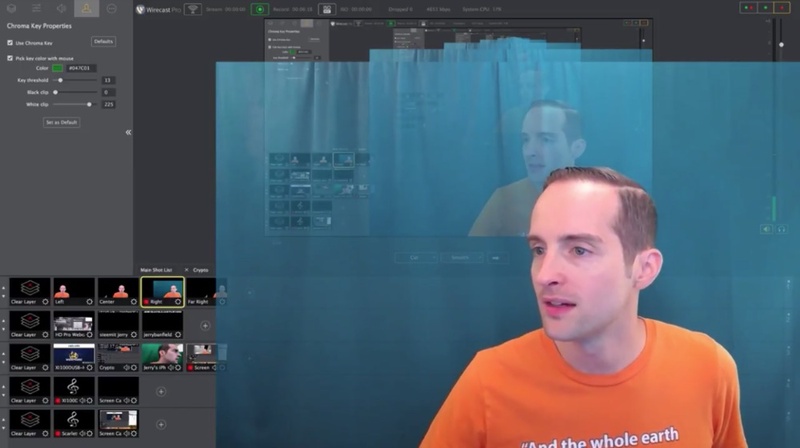 My hope is that this tutorial will be very helpful to show you how to do it in Wirecast or in any software with a chroma key! The key to doing this is getting the exact right color. In Wirecast here's how you go pick the color. It's got the Chroma key option in the upper left over here, and then what you need to do is get the exact right color. When you get the exact right green color, it will fade everything out correctly without making it look distorted. Now, this exact color will depend on the lighting you have got, it will depend on the exact green screen you have got, and it will depend on the pigment of your skin, and potentially a shirt you are wearing, your hair or any makeup or costumes or whatever. For me, this one has worked perfectly, the number #D3FEED. Now, what you can do to experiment, you can pick a color with the mouse. You can just click "pick a color" with the mouse, and then you can test out different colors to see which one looks the best. 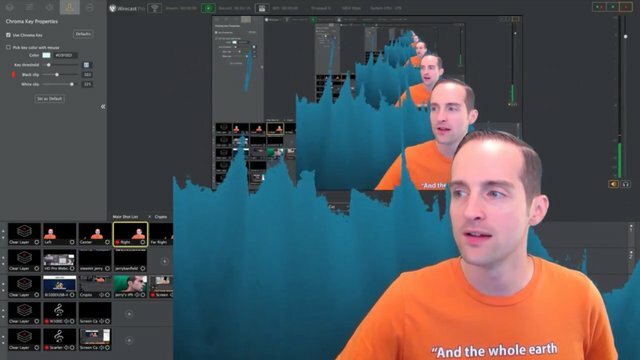 Now, what's really nice with Wirecast is that you can just do this once. You just put the color in there and do it one time, and then it's there indefinitely. 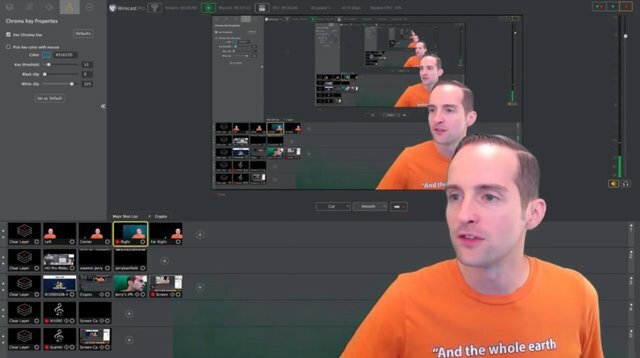 You don't have to go through and pick a color every time you use the software, and then render the video. It's just automatically recorded with the Chroma key in. That's why I love Wirecast so much because it just makes this whole process so fast. All I do, I literally hit this record button up here and it records the video. 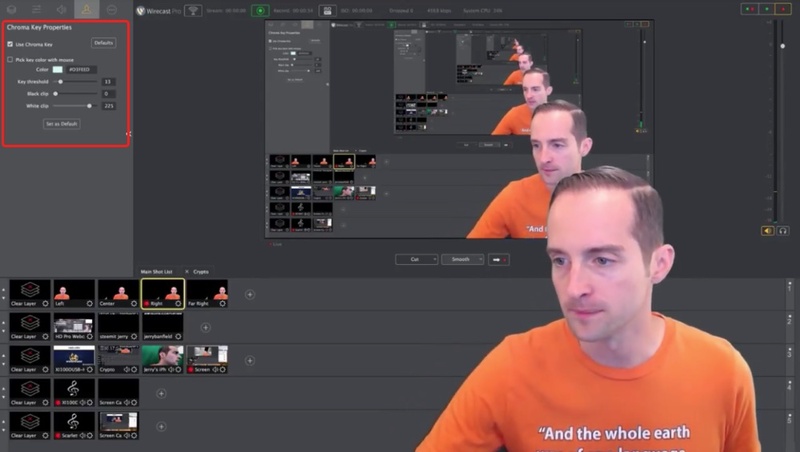 The Chroma key is just right and I can move my face around wherever I want, and it just stays like that. Now, with each of these, you have got the "Key threshold" here, which means you can turn the "Key threshold" up or down. If you turn the "Key threshold" up a lot that can impact what it looks like. 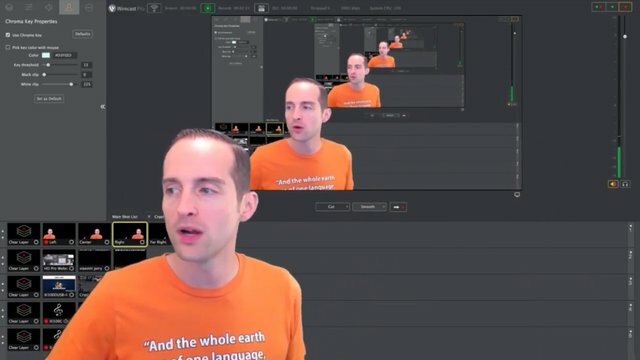 Now, if you have got your color picked correctly it shouldn't matter too much, but you see then, if you turn the "Key threshold" down to zero it brings the green screen back. The ideal number you want to get with the "Key threshold" is to put it to the point where it gets the exact right amount of green cut out, but then doesn't distort any. Now, this lighting is just working so good. Even cranking the "Key threshold" up all the way is not messing it up, but if I pick a different color with it that will be a different story. Also, you can use "Black clip." "Black clip" essentially goes at the dark end of the green, hence the "Black clip," and you can see as I play with it how it comes in and out here. So, I turn the "Black clip" down to zero and it cuts out all the black, and then when I turn it up, you can see how the black comes back in. This will show you how your lighting is too, because with perfect even lighting it should fade out all nicely at once. You can see my lighting is pretty good because it fades all out together, but it's lit more at the top than at the bottom. So, when I "Black clip" it, it fades from top to bottom because there's more white at the top. Now, the opposite is true if I use white. So, if I use the "White clip" you can see it fades from the opposite direction because there's more white at the top of my screen. It's still pretty even though. If you mess with these too much, you will get distorted effects on your face, you will get distorted effects on your shirt and it will look all messed up. If you really want to have a good time with it, then what you can do is pick the color feed with the mouse. So, if you turn off the Chroma key, then it turns it off and you can see what it looks like. Whatever color you pick makes a big difference on how the green screen looks. So, you can pick a color this way or you can just try to pick a color with the mouse and it will do it off that. If I turn the lights off we can make this more interesting. You will see what happens when it gets distorted a bit. You will see how my face is distorted there. If I mess with the "Key threshold" it ends up looking different in there. It messes with the "Black clip" and the "White clip," you can get it looking all distorted if you do that, and then if you get the camera adjusted a little bit, this can just be a disaster sometimes. So, what I do, I just leave it. I get the lighting setup exactly correct. 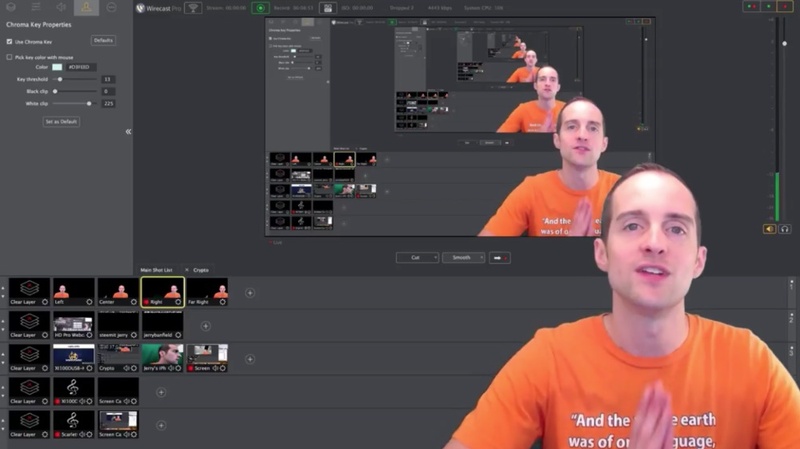 You can see how easy it is to distort, but Wirecast is really good once you get it set properly. Once you have got the color in there properly and you have got the right balance of black and white, and key threshold, you can just leave it there and everything will just look nice. I have spent probably 20 to 50 hours over the years fooling around with this and I hope this is helpful for you to just get this set up because it's so annoying. It's like who do you learn from? Who will tell you how to do this? Well, I've got this in there now. It works and it's all set up right. If you hit "Defaults," if you mess it up, you can see what happens. If I pick a different green color it screws the whole thing up in here. You see that when I hit "Defaults" it messes that whole color up, and then everything is all screwed up from there. The screen doesn't look right anymore, then you got to try to go in pick a different green, and then you try to use that different green, but then that doesn't work very well either. Then you are messing with the "Key threshold." If you put the "Key threshold" up all the way it works, but it's likely to distort the face if you do that. This can be such a pain. As you can see you know you have got the wrong color if you have got your "Key threshold" at like 13 or something here, and it's not doing anything. So, if you just play around with the colors, you want to get the color as close as possible to your screen. One thing you can do, you can literally just grab the color, you can just take a screenshot of the color, you can pick the exact color off of a dropper. You can then use that color and you can see using that color made a big difference. The problem is the color because you can see there's green distortion in the background now. There's a little bit of green distortion on this, and it doesn't look great. So, you got to pick the exact right color and it can take some time to just pick that exact right color. Just try color after color until it just looks right. Once you get the right color, it will look right, and then the lighting will be beautiful, and then once you have got that right color you are all set. You don't need to touch it again, just leave it and it's perfect. There are lots of different colors that can work. I put this different color in and even though those two greens that I just put in are really different colors, they still both work. I'm very grateful to have this to share with you today. I've worked so much on this over the years. 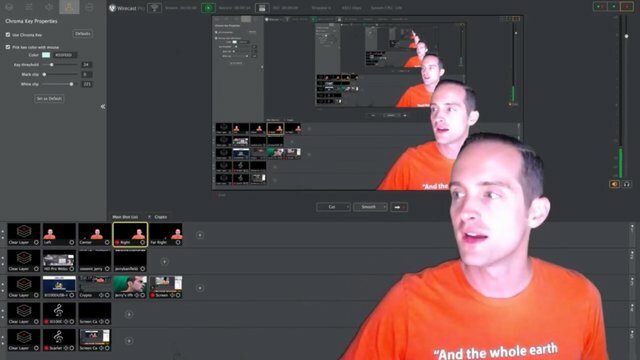 It really can be so easy, you never have to struggle with doing a green screen again. When you get these right, you get the lighting right, you get the screen behind you right — get something that's not too wrinkled or distorted or shadowy, that's a consistent color — you get that right, and then you test it out with different shirts, test it out with different hair dos or whatever, you pick out that exact right color or color from a spectrum. Usually, the default "Key threshold" should work good. 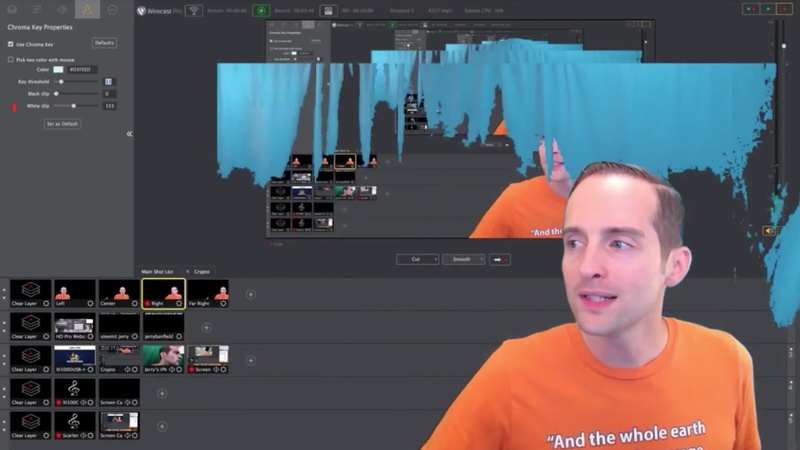 Use the Chroma key and Bam! You have got it. 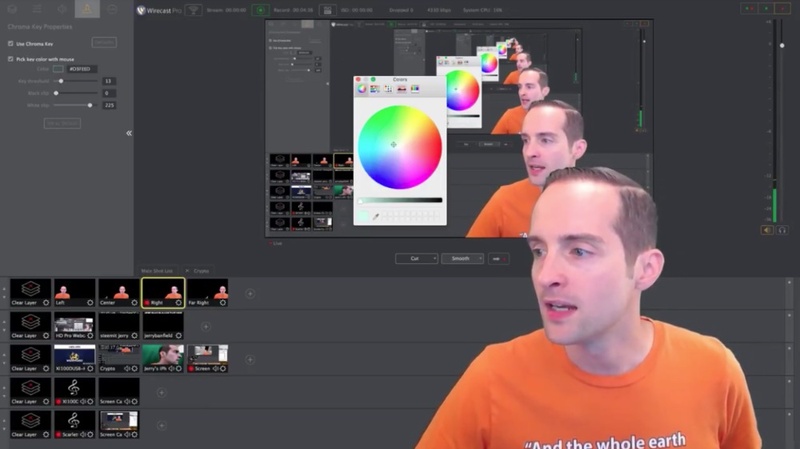 You don't ever have to struggle again with the Chroma key. I love you. You are awesome. I appreciate you reading this tutorial with me and I hope this is helpful for you. If you found this post helpful on Steem, would you please upvote it and follow me because you will then be able to see more posts like this in your home feed? Facebook page with 2,264,182 likes. YouTube channel with 233,987 subscribers. Would you please make a vote for jerrybanfield as a witness or set jerrybanfield as a proxy to handle all witness votes at https://steemit.com/~witnesses because we are funding projects to build Steem as explained here? Thank you to the 6000+ of us on Steem voting for me as a witness, the 2 million dollars worth of Steem Power assigned by followers trusting me to make all witness votes through setting me as proxy, and @followbtcnews for making these .gif images! Hey @jerrybanfield, you know I have seen a lot of Steemitans who creates a good content. One thing special about you and that is your content is long enough and resourceful. You please keep writing and sharing us a great information. I would like to call you as a Knowledge Bank. Hope you don't mind. You are idle. Blessed. I love you too. You are great. great article, thank you for the knowledge you have given us, hopefully we can try it perfectly as you. Good post .. But where is your dtube posting? Also visit my dtube .. I'm a bot. I am here because @wil1liam wanted to know how high this post is in Hot or Trending. You want to know what your post's rank in Hot or Trending is? As a gift your post will be upvoted for free! - This bot was development by @wil1liam. Wow! It's a nice one keep it up. Hey @jerrybanfield, that's pretty cool tips, thank you for sharing! Jerry Jerry whats ur favorite color? Hi Jerry. I read your post on witnesses from 8 months ago. I have been on Steemit for 5 weeks and i love it!!! I want to do more and am thinking of becoming a witness. However please can you give your honest opinion on the competition nowadays of getting in to the top 50-70 witnesses? Would it be better for me to grow my presence and following FIRST rather than end up spending loads running a miner with no returns until i get witness votes? would love to hear your opinion and thoughts on this.